Eight years ago, Aishwarya Rai Bachchan and Abhishek Bachchan showed us how perfect they are for each other with their performance and chemistry in a critically-acclaimed film Guru. And now the couple is set to work together in another film titled Gulab Jamun. After a lot of 'will they or will they not', Aishwarya Rai finally confirmed that she'll be sharing the screen with hubby for the first time after Aradhya's birth. 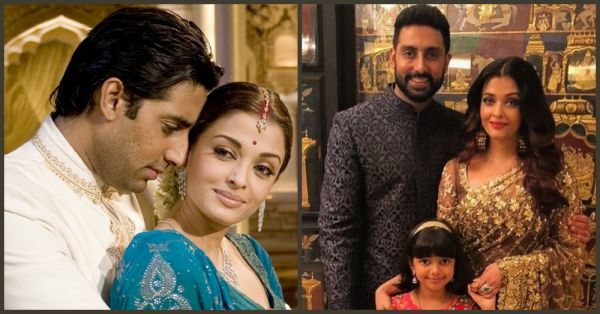 Confirming the reports, Aishwarya revealed in a Mid-Day interview that the script was offered to them a year and a half ago, but they couldn't sign it as Abhishek was keen on taking a break. Once the film came in discussion again, she asked him to decide. "AB and I agreed to do Gulab Jamun. I told AB that he needs to decide what he wants to do after Manmarziyan." Speaking further about the film, the Fanney Khan actress shared that it's a beautiful script and Abhishek and she fit the bill perfectly. "The script had to be interesting if a real-life couple is coming together." Earlier, the couple was busy with their individual projects. While Abhishek was working on Anurag Basu's Manmarziyan opposite Taapsee Pannu, Aishwarya was busy with Fanney Khan. Recently, Abhishek made the headlines by hilariously yet respectfully shutting the trolls against him and his financial status. Looks like the most popular couple in Bollywood is finally ready to give their daughter Aradhya and us a chance to see her mommy and daddy together onscreen. Can't wait to feel the love!